Mud clings to the boots, it cakes onto cloth and fabric—and sometimes it can even feel like it globs onto your spirit. Mud is hard to wash completely away: There are still granular specks after you shower, the grains seemingly forever attached, becoming a part of your body, of you and your history with it. 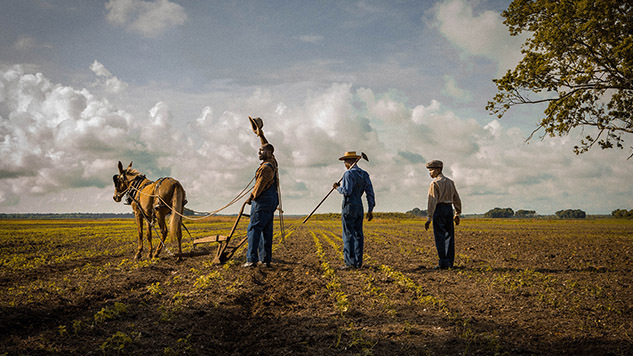 In her new film Mudbound, Dee Rees makes the assertion that trauma is like mud in the way it sticks to us like glue, how it binds us together, almost a shared cultural language. Framed like a family epic examining the dynamics between half a dozen characters, Rees’s film slowly sprawls, settled in mud. The film really does sprawl, taking its sweet time to map out the lives of the white McAllan family—once somewhat well-to-do until patriarch Henry (Jason Clarke) is hoodwinked into buying a rural Mississippi shack in lieu of a middle class home—and the African American Jackson family, who only want to plant their own lives in the South. Both families have members returning from World War II: Henry’s brother, Jamie (Garrett Hedlund), and the son of Jackson heads Hap (Rob Morgan) and Florence (Mary J. Blige), Ronsel (Jason MItchell). Jamie struggles to reconnect with his brother, is estranged from his father, Pappy (Jonathan Banks), and the dynamic he shares with Henry’s wife, Laura (Carey Mulligan), tiptoes around increasingly treacherous territory. The only person left with whom Jamie can connect, who has any idea of what he went through in war, is Ronsel. The question the film may pose might be: To what degree are Jamie’s and Ronsel’s individual experiences and privileges, or lack thereof, a hindrance to their friendship? Should such privilege be an obstacle at all? These are tough questions, and any answer is sure to catalyze a strong reaction. Argue that their friendship “transcends race” and you might end up erasing the fundamental differences in the ways they’ve experienced life and how it informs how the two act toward one another. Ronsel is hardly quick to be friendly to Jamie, and several times Jamie pulls pranks on Ronsel that, had the two not known each other, could have been preludes to horrible things. But say that their racial identities and respective perspectives are fundamentally informative of their friendship, and you might be at risk of not finding the alleged universality of their fraternal interactions. Hierarchical lines of power are supposed to obviously steer these scenes—or at least the way an audience might approach these scenes—but the film, and by extension Rees, is fidgety as far as placing such a dynamic in focus, almost as if she’s unwilling to lean towards one clear idea of what their races mean for one another, toward any answer for the question her film poses. Rees is, nonetheless, at her strongest when trying to explore this question, and questions like it, even if her mixed feelings can be unsatisfying. She sometimes seems to want to show the quiet ordinariness of racism, as opposed to the shock and awe of a scene like Pappy screaming racial epithets at Ronsel. At the very least, Rees can dance around a big, uncomfortable question, while letting something just as gutting like Jamie and Ronsel’s PTSD serve as the film’s most potent emotional arc. That kind of trauma, she asserts, sticks to you like mud, whoever you are.